In the beginning, CattleBoyZ Original BBQ Sauce was developed by a cattle rancher in Alberta, Canada who did not want to mask the taste of his beef with an overpowering sauce, but enhance it. CattleBoyZ Original started out on the ranch, but today it’s sold throughout North America. CattleBoyZ Foods has brought this Albertan’s savory sauce to the marketplace along with a second flavour – Cattle Boyz Honey Hot BBQ Sauce. Since the introduction of CattleBoyZ Original BBQ Sauce, CattleBoyZ has also added a few extra BBQ sauces, like, their Sweet Chili, Southern Q and their Wing and Hot Sauce. Not only do they have BBQ sauces, but they also carry seasonings to make your meat, veggies, etc. even better. If you follow me on twitter you might remember a few weeks ago me tweeting about receiving an awesome present just in time for grilling. 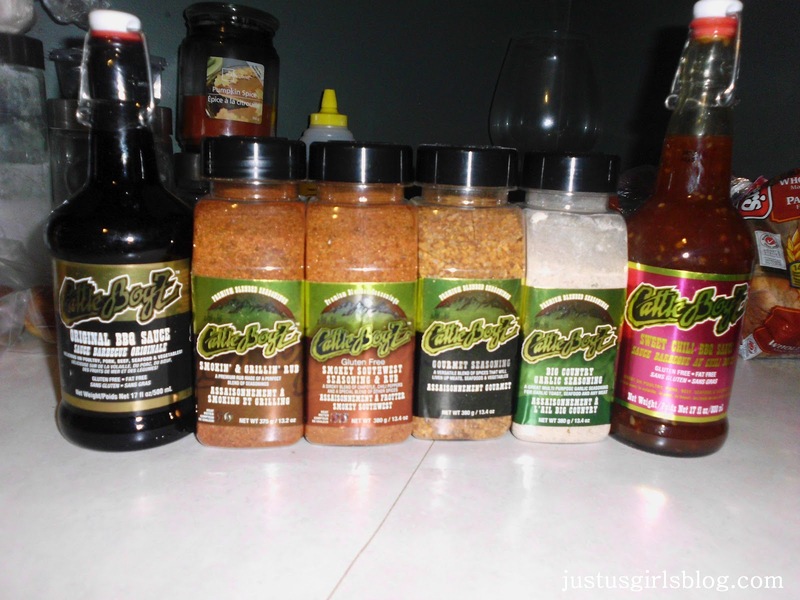 We had the pleasure of reviewing the CattleBoyZ Starter kit which included Original and Sweet Chili BBQ sauce along with four of their seasonings, Gourmet, Smokey Southwest Seasoning & Rub, Big Country Garlic Seasoning and their Smokin' & Grillin' Rub and boy did we enjoy them. We were already a fan of their Sweet Chili sauce. We buy it all the time at our local Costco's. I find the sweet chili to be amazing on chicken and works great on stir fry if you want a little kick to it. We never tried the original BBQ sauce and now after tasting it I'm wondering why we never thought to check and look for it. It's delicious on chicken, ribs, pork, hamburgers, hot dogs, you name it. I love that it has a little bit of a tangy-ness and that it's not too hot, just right so that my kiddos can enjoy too. As for their seasonings, oh boy were they ever good. If you're cooking on the grill, crock-pot or on your stove, these seasonings will sure make your food taste wonderful. My favorite had to be the Big Country Garlic Season. Although all were really good, I loved that I could add this seasoning to potatoes, broccoli, asparagus, chicken and so much more and I loved how the outcome turned out. Definitely worth the try if you haven't already had CattleBoyZ, you won't be disappointed at all, I promise! Disclosure: All opinions are my own. I received the CattleBoyZ Starter Kit at no cost for the purpose of this review. No other compensation was received.